“The finest film of 2018 so far,” says K. Austin Collins in Vanity Fair, and, although it hasn’t pleased every critic, it’s entranced enough of them to remain in the top 10 most critically acclaimed films of 2018, as measured by Metacritic. 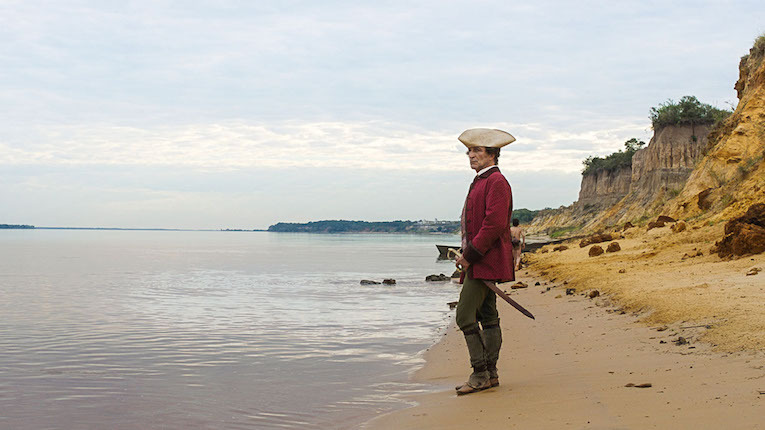 I’ve previously named Lucrecia Martel’s fourth and most remarkable feature Zama as my favourite film of TIFF 2017 and indeed my favourite of 2017 overall, but it did not receive a commercial release until this past spring, and is just this Friday finally arriving for its only Halifax screening, at Carbon Arc. “See the movie, read the book and then, for pleasure, see the movie again,” suggests Manohla Dargis of the NY Times. The remarkable 1956 debut novel from Antonio Di Benedetto has only recently been translated to English, and it is a mesmerizing read—but I’m very glad that I got to experience my first viewing of the film without any foreknowledge of where the narrative was going. It’s truly not necessary to fully grasp everything the film offers on first viewing… it is as much a hypnotic sequence of sounds and images as a narrative structure (though that structure is there), and my best advice is to let yourself just go with it. But I have also found that the film’s framing choices and visual puzzles have stayed with me in the year and more since first viewing, and for a deeper dive I recommend not only the (reasonably short) novel but also this Q&A with the director from New York’s Lincoln Center.